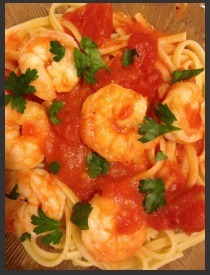 This shrimp and linguine is a guest recipe post from Sevgi the author of MealPlan4Me.com. Sevgi blends different flavors and cultures to come up with simple and easy recipes that taste amazing. How to Crab is thrilled to have such a talent contribute to our site. Thank you, Sevgi! This is a wonderful shrimp with linguine recipe! It is super easy to make which is great for those busy weeknights. To speed this recipe up even faster, purchase shrimp that has already been peeled and deveined and use angel hair pasta instead of linguine! To prepare this dish, you will need to start by boiling a pot of water for the pasta. Add the pasta and cook according to package. While the pasta is cooking, add butter and the extra virgin olive oil in a sauce pan. Add the shallots and garlic and sauté for about 3-4 minutes. Season the shrimp with salt, pepper and red pepper flakes. Add the shrimp to the sauce pan and cook them for about 2-3 minutes or until pink. Add the wine and bring to a boil. Add the tomato puree and lower the heat to medium to low heat for about about 10 minutes. *If the sauce gets too thin, add 1-2 Tablespoons of flour to thicken it up. Once done, place the pasta on a plate, pour the sauce on top of the pasta and sprinkle with the chopped parsley. Serve immediately. Looking for more easy and tasty recipes? 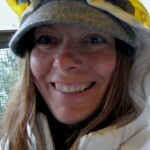 Visit Sevgi’s website at mealplan4me.com for a free weekly menu, meal planning tips, recipes and more! Rod fishing for Dungeness crabs is my solution to solving the age old mystery of the most common crabbing debates (i.e. times, tides and baits). 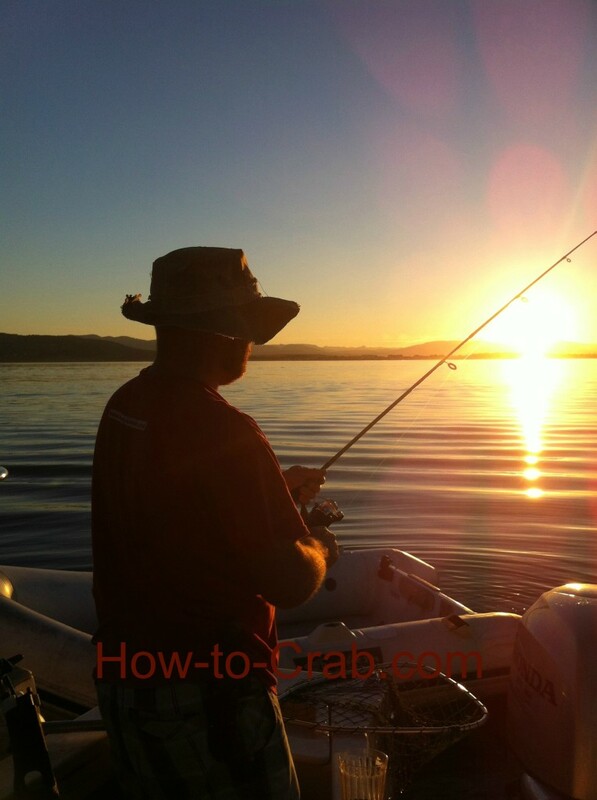 Find your hotspot and fish for crab with a rod, it’s so much fun, rewarding and a hands on approach to crab fishing. None of this set a crab trap and wait a couple of hours business. Over the course of any given summer I pretty much try every possible crabbing technique to get a Dungeness crab on my dinner plate. I’m out on the water a lot and have plenty of time on my hands to experiment. These summers have taught me a thing or two about catching crabs but the main thing that sticks out is to never veer off a hot crabbing spot once you find it. So many factors come into play when you’re crab fishing and people offering advice on their tried and true techniques that it’s hard for anyone to find their own perfect strategy. So find yourself a hot spot and go rod crab fishing. It takes all the guess work out of catching crabs because the results (if your method is working) are instantaneous. A fishing rod with at least 10 lb. test line. An assortment of bait to experiment with. Tie your bait on tightly to the end of the line. When you have a bite, slowly reel in the crab. 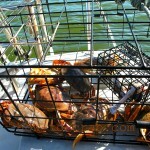 When you get the crab close to the boat have a net ready to scoop up the crab. Measure and keep (if it’s legal) or release. Throw your line in again. Once you have mastered the method experiment to get a feel for what the crabs really like. Keep a tide book handy and notice a difference in the changing of the tides. Cast your line into shallow water or vice/versa. Do you have some tried and true methods to catching crabs? Let’s here them! Use the comment section below. 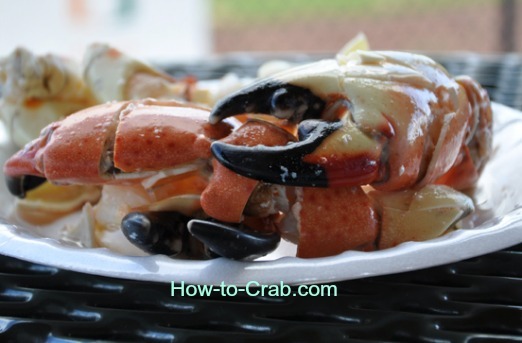 Stone crabs are delicious –no doubt about that but what is really remarkable about this crab is the crab fishing industry itself. In Florida, for nine months of the year, October 15 until May 15, a trap catches the crabs and then one of the crab’s claws is removed. The crabs are then released back into the ocean, alive. That one claw is a delicacy. And rightfully so, it takes the returned-to-the-ocean-crab 12 to 24 months to re-grow its claw a legal size for harvesting again. Yes you heard me correctly… crabs are just like Wolverine, they can loose a limb and it grows back… bigger –better –faster –stronger. This makes them a good choice of fully sustainable seafood. Fishing for crabs this way (one claw at a time) greatly increases their chance of survival and minimizes the impact the fishing industry has on these crustaceans. If both of their claws were removed then they would have limited defense against predators. It would make it much more difficult to find food, considering they use their powerful pincers to crack through oyster shells –their main food source. Don’t worry about the crab loosing a claw either, these crabs loose their limbs often and easily to escape from the clutches of a predator. When their limb breaks off, they heal themselves quickly with little or no blood loss. In Florida, it’s illegal to keep a whole stone crab. A minimum size of 2 ¾ inches, measured from the very tip of the pincer to the first joint, is the legal size limit. If both of the black-tipped claws are of legal size then they can be take but it’s not recommended. Lacking two claws severely impacts the crab’s ability for food and their ability to re-grow both of their claws. It is also unlawful to remove any claws from female crabs that have eggs. Because there is such a huge demand for the claws, much more than the fisherman are able so supply, this is an expensive treat. To purchase claws be sure to measure a pound per person (which is plenty enough due to the richness of the meat). Stone crabs are to Florida what Blue crabs are to Maryland. They even have the same grading scale; from mediums sized to jumbo to colossal. The price for the claws starts at $22 upwards to $45.00. Storing your claws for later is also a bit tricky. If you were to freeze a raw claw the meat would stick to the insides of the shell making it impossible to eat. This is the main reason why only cooked claws are sold. You can freeze your cooked claws for up to six months (if you can wait that long to eat them;)) Previously frozen crab tastes the best when they have been thawed in the refrigerator over night. If you catch your own, be sure not to place them on ice. Have a cooler with you to keep them cold until you are ready to cook them. Cooking stone crabs is so much easier than any other crab. You can cook your claws by putting them in boiling water or by steaming them. Boil them for 6-7 minutes or steam them for 8-10 minutes. Run them under cold water immediately to stop the cooking process. These crab legs are usually served with a mustard sauce. 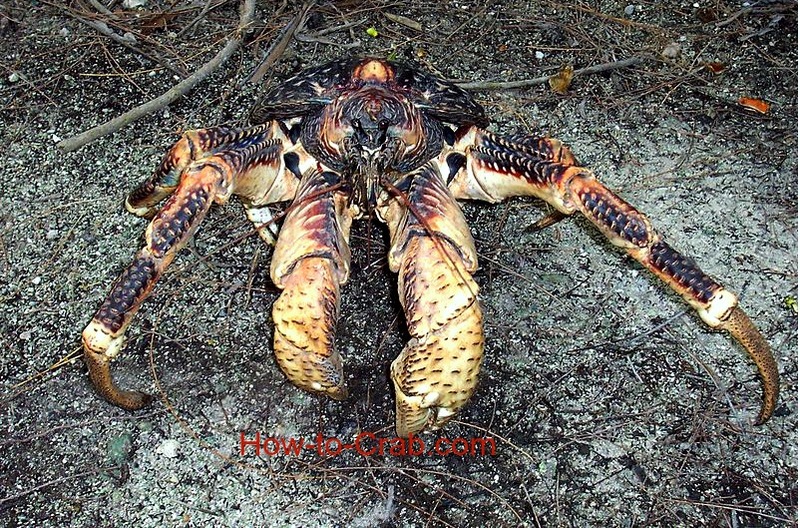 The coconut crab is a type of land-living crab which is sometimes known as the ‘robber crab’ or ‘palm thief crab” or in more recent times (as in right now, I just made this up because…come on… look at that beast!) ‘Skull crusher.’ At one meter from head to tail and weighing in upwards of 10 pounds (think of a fat three month old baby) it is the largest land-living arthropod in the entire world. Their closest cousin is 1/100 of its size…the hermit crab. But unlike the hermit crab the coconut crab barely gets its feet wet. They may start their life in the ocean but they don’t stay there for long, a month tops. A female crab will release her eggs into the ocean where they hatch into larva creatures called zoeas develop into glaucothoe and head out of the water in search of a shiny new shell it can call home for a few weeks. It then rids itself of the shell, develops lungs and like a true villain -goes underground. At this stage in its life it is becoming an adult crab, its abdomen hardens, it makes itself a burrow and will live its life on land. Its days are spent about two feet underground and nights are spent scavenging for food. Only female crabs will return to the ocean to lay her eggs, and then it’s business as usual –hunting and gathering food to take back to its home. Most of the food in their diet is plant based –coconuts and other tropical fruit but on occasion it will scavenge for dead animals. The meat from this crab is considered a delicacy some believe it to be an aphrodisiac. This is all terrible news for the coconut crab. 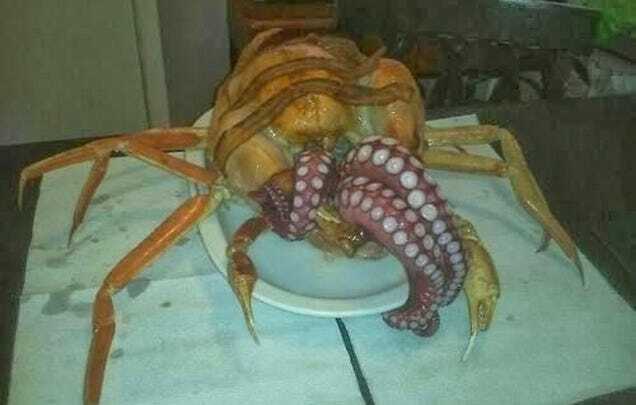 Don’t eat this crab! It is in danger…despite it being a massive and powerful crab and having no natural predators (other than humans). People hunt them for their sweet meat. It once populated Australia and Madagascar but not one can be found there anymore. Christmas island has the largest population of these crabs but the population is meager, comparatively. It can also be found on other islands around the Indian Ocean and the south Pacific. Measures are being taken to protect the crab’s population. There are currently a number of legal restrictions in many areas regarding the fishing of this crab, including minimum size limits as well as limits regarding the number of crabs that may be harvested. If you find yourself in the grips of one of these pincers the only way to coax the crab to release you from its painful grip is to rub its belly. Their pincers are not the only threat they pose to humans… Coconut crabs may become poisonous depending on their diet. If the crab eats Cerebra manghas, a common type of sea mango found in these parts, it may become poisonous to humans because of the presence of certain steroids in the sea mango. The consequences of eating this crab may be cardiac arrest.